By asking the right questions, companies can design robotic systems that maximize end-of-line efficiency and ROI. Today’s manufacturers have started looking downstream more and more for automation opportunities. And when they do, more are choosing robotic systems. 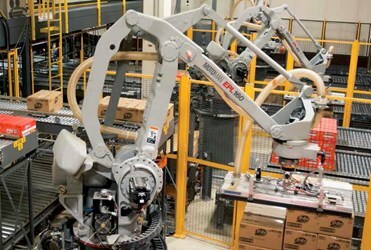 According to PMMI’s 2008 Packaging Machinery Shipments & Outlook Study, shipments of robotic palletizers rose by more than 12.5 percent in 2007. Designing a robotic palletizing cell has become more complicated as companies invest more in environmentally friendly and sustainable packaging. To reduce dunnage, standard corrugated cardboard cartons are being replaced with thinner-walled pressboard, shrink-wrapped bundles of product on corrugated pads, and even loose product in trays. Add increased demand from club stores and marketing changes to the mix, and manufacturers need to account for an even wider range of packaging sizes, shapes and materials.